Courtney Stodden known as a reality show contestant who participated on such shows as The Mother Daughter Experiment and Celebrity Big Brother usually wears heavy makeup to look like her idol Marilyn Monroe. But just recently the 22-year-old has been seen without makeup with a lightly-powdered face. She was almost unrecognizable. Courtney, who shaved her head last month to pay memorial to the child she lost, wore a blonde wig. 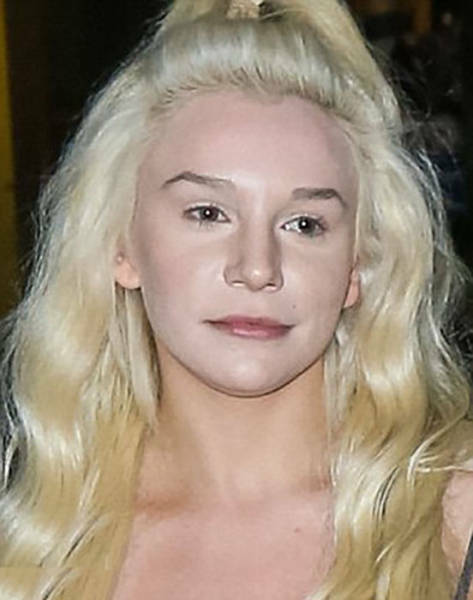 1 response to "New Pictures Of Courtney Stodden Without Makeup (6 pics) "